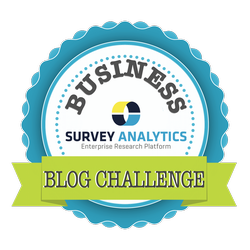 We are just over halfway through The Survey Analytics Business Blog Challenge, and today's topic is to share some lessons we have learned along the way. is perfect for a small-medium sized business or startup to share some tough love and lessons learned along the way. Unfortunately, the marketplace is more often than not highly competitive - and even saturated with bad products. These bad products are not going to last long in today’s world of speedy innovation, but they still may make some noise and get in your way. Continue reading to see some of the lessons we have learned along the way as a software company in a highly competitive marketplace where we are often outnumbered in resources. "A market is never saturated with a good product, but it is very quickly saturated with a bad one." Small businesses today have to know how to get feedback, pivot, find their strengths and make their products/services appealing to their own niche. Your direction can change in a matter of one day. Sometimes when things aren’t working out, you open your eyes and finally understand how to improve upon it. Have you seen the show Silicon Valley on HBO? Pied Piper was unable to compete head to head with "Hooli" the massive global leading tech hub in Silicon Valley, so they found a way to do something small, better than their competition. In just one night at TechCrunch Disrupt, the company CEO wiped clean his entire code and recreated a new, clean, simplified version of his compression algorithm. Meanwhile, the head of Business Development was out asking blue sky ideas and getting feedback from the audience to find what might stick. As a young, innovative company - you're going to make mistakes. It's how you pivot that matters the most. We have consistently been working to enhance the appearance and visual aesthetics of our interface. However, our customers have worked with us for long periods of time because our stuff works. There are more and more tools appearing in the marketplace with an amazing, "sizzly" user experience and clean, flat, user-friendly, visual interface - but their functionality is so limited. They are using the sizzle to sell. And when we run into issues and if it doesn't work up to par, we make it work in a reasonable amount of time. Building a product that consistently works is more important than just throwing a fancy skin and design onto something with just three limited features. It's more and more common that you find businesses using tons of different tools to complete one job. We aim to be the tool where you can do it all in one place. Our software was developed in an "open source, open standards" using java, linux and MySQL. Our business model is also run on being an open source of information with open standards. We are very approachable and personable to share our resources and trade secrets internally, with any of our customers or prospects. A true connection and effective communication and understanding are very important to us. We want to leave the book open to make sure our solution works for you in the long term. We won't lead you on to believe in us if we are not the best solution to fit your requirements. There are no shortcuts when it comes to security. It's better to be safe, than sorry. We've always held security as a very important factor of our software. As we are working with proprietary information and personal data, it is very important for us to hold the highest standards of security and follow all of the guidelines to be compliant. Data breaches are on the rise, and they are expensive. There has been a 12% increase year over year in security/data breaches (via IBM). We currently use CloudFlare, and we are SOC-2, PCI DSS compliant and also hold compliance as 853-a low risk from the CDC. We also are working our way through the checklist towards becoming HIPAA compliant to better serve our customers dealing with patient and medical information.